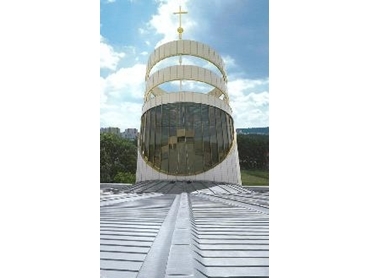 Architectural cladding and unique roof design are now amongst the most important of additions to any new building design. Getting a roof profile that is not only functional but also incorporates a cutting edge design is dependent on the type of machine used. According to Anthony Mastro, head of Proofmetal Roofing in Sydney, the Schlebach Quadro-Plus Multiple Profile Roll former machine, available from Power Machinery Australia , can be used for getting the appropriate roof or cladding design. According to Mastro, the Schlebach Quadro-Plus Multiple Profile Roll former is the preferred product in the architectural sheet metal industry because it ‘makes more profiles (soffit, nail strip, snap seam, mechanical lock) with compressed changeover times of 30 seconds to 10 minutes. This roof panel machine creates panels for all applications such as industrial, light commercial as well as residential applications. The Schlebach Quadro can roll out 8 or 9 styles at once, meaning that there is a reduced downtime and the machine can just keep pumping out roofing and cladding pieces. Power Machinery Australia import and distribute the Schlebach Quadro-Plus Multiple Profile Roll former machines. This machine enables to zip through nine different profiles quickly, with the flip of a cassette. The Schlebach Quadro-Plus saves costly hours in changeover and makes perfectly roll formed panels for 1 inch and 1.5 inch mechanical lock, snap seam, snap seam/nail strip, and U-panel, plus 2-inch structural mechanical lock. The machine provides other features such as slitting, taping and cutting and an unprecedented 65 roll sets, factory aligned cassette system as well as hybrid drive system for less lubrication. This machine is durable, portable and upgradeable. The Schlebach Quadro roll former is known for versatility and speed and can be used on-site or in-shop. The Schlebach Quadro-Plus can be used for making complex roofing systems, cladding profiles and colour-bond fences at varying lengths.